In Tokyo, we stand on the left of escalators in the subway and train stations and people who are in a hurry walk up or down on the right. In Osaka it’s the other way around. Nobody knows why and we’re not supposed to ask. Someone pointed out that by that same reasoning, we should also ban walking on the staircases. After all, that’s at least as dangerous as walking on escalators. Perhaps walking should be banned altogether. I don’t know anyone who hasn’t fallen down at some point in their life. 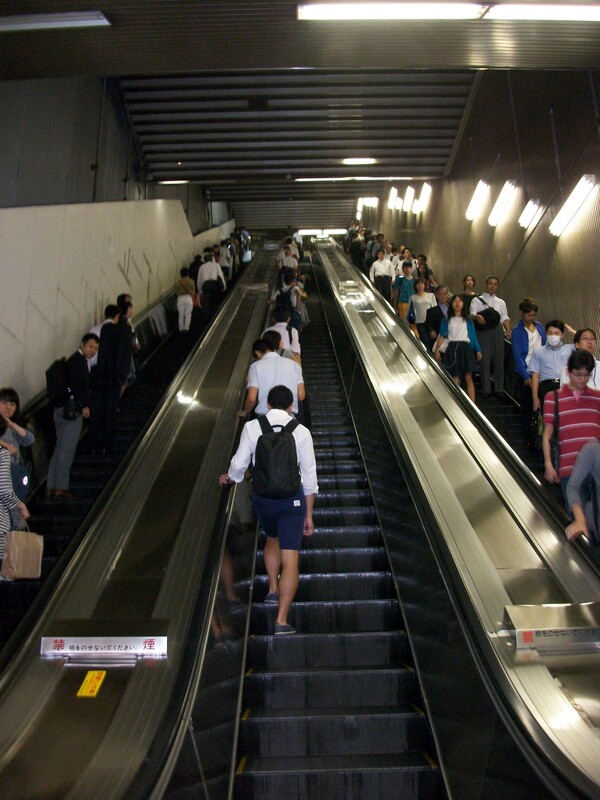 The escalator walking campaign is just a campaign and therefore unenforceable, and although the Japanese are generally a fairly obedient group, the idea has been blatantly ignored. There are good reasons for this. People who are late don’t get any less late by waiting to get on the escalator. Case in point: Despite Japan’s usual heroic feats of engineering, the almost unforgivable Oedo Line, which opened in 2000, is a total disaster. The cars are too narrow, the trains slow, the noise unbearable. Since it’s relatively new, it was built to run beneath existing lines. At some points, it’s 40 meters down. At some stations it takes six or seven escalators to get to street level; you have to factor in an additional 10 minutes to your travel time just to get out of the station. In addition, the platforms are much too narrow. They have sliding platform gates to keep people from tumbling onto the tracks, but the congestion during rush hours can be horrible. If people didn’t walk up the escalators, it would be human gridlock. I kid you not. Someone mentioned that many escalator accidents are caused by people tripping over other people’s walking canes. We could ban those, too. And while we’re at it, we could ban baby strollers, wheelchairs, suitcases, shopping bags, bunches of Ikebana flowers, large bags of sports equipment and any musical instrument bigger than a piccolo. And while we’re banning all those things, we could also ban people who don’t necessarily walk on escalators but are annoying, like people who take up two seats or stink of cigarettes or garlic or fall asleep on other people’s shoulders or wear too much perfume, and, of course, all smart phones and other handheld devices. But I had another idea. Instead of spending a gazillion yen on a bunch of unnecessary new stadiums for the 2020 Olympics, let’s just tidy up the ones that already exist and instead spend the money to build a separate subway system for all of those space hogs and annoying people to use. Donald Trump can decide who is qualified to ride which one.